Once again, like in the Wonder Boy review, the in-game screenshots are my own. Right as the game starts, Chell (the protagonist) wakes up after a long period of sleep in a completely unknown room. 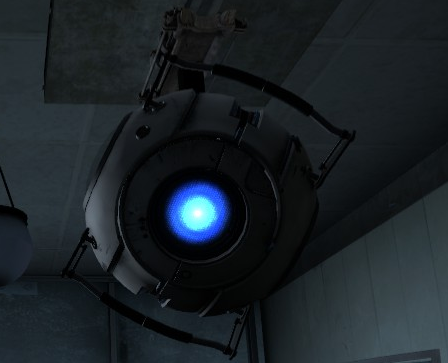 Soon, the place starts falling apart and the shocking realisation that Aperture Laboratories is a far bigger place than you thought in the first Portal comes… Not long after, you guessed it, it’s time for more testing! But things are a bit different, a bit more complicated this time… And only get more so as the game goes on. The story takes a few turns, some interesting revelations come to light and it will be another (if still secondary) reason to keep playing. Valve’s stellar sense of humour shows once again, with several semi-funny, semi-serious moments that will have you conflicted between laughter and sadness. But the game does not really take itself seriously, the writing is mostly lighthearted and the player’s focus is never taken away from the main strength – the puzzles. Portal 2 also fails to produce a meme nearly as powerful and memorable as the first game’s “The cake is a lie!,” but that’s not really a fair expectation to have from it now, is it? 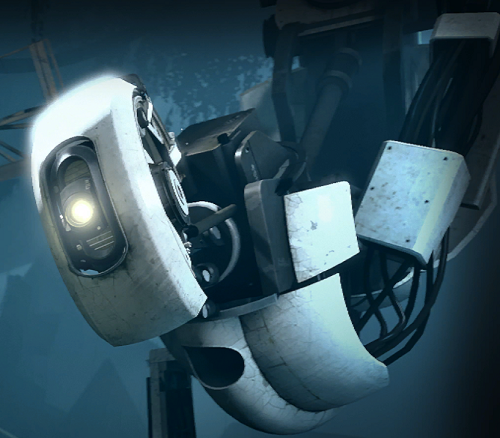 “Character development” is not exactly the first thing that comes to mind when one thinks of Portal… All of it in the first game could be summed in one word, “GLaDOS.” The cynical robotic overseer of Aperture Laboratories is back, of course, and, apparently, there’s much more to be learned about her. Once again, she is the true star of the game, not without the help of Chell once again being mute and largely irrelevant aside from driving things forward – not in any way more special than any other human in her place, at least. Chell’s one memorable quality is once again her being very heavy (most likely due to her robotic legs… Or is GLaDOS just lying?). But perhaps I am being too harsh. While Chell is mute, there is still a certain dynamic between her and GLaDOS. True, it’s mostly driven by the latter, but, like the relationship of Gordon Freeman and Dr. Breen in Valve’s Half-Life series, it is a case where the role of the silent protagonist shouldn’t be entirely overlooked. But back to GLaDOS. She’s even more awesome this time, which is quite a feat. The developments in the story and her reactions to them enrich her character greatly. I’m sure some of them will come as a surprise to many players. Last, but not least, there is the mysterious Cave Johnson… But telling you anything about him would just spoil your experience. You’ll have to find out yourselves. The gameplay remains the same at its core, you have to place portals on the appropriate surface and solve the puzzle at hand by pushing that button, then obtaining that cube, placing it on the designated button on the floor and opening the exit door… Or similar. 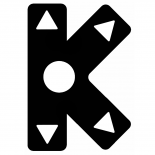 As in the first game, you use physics and the environment to your advantage, by accelerating by jumping from a high place into a portal on the floor, or by knocking down and disabling a turret by dropping a cube through a Portal on it. 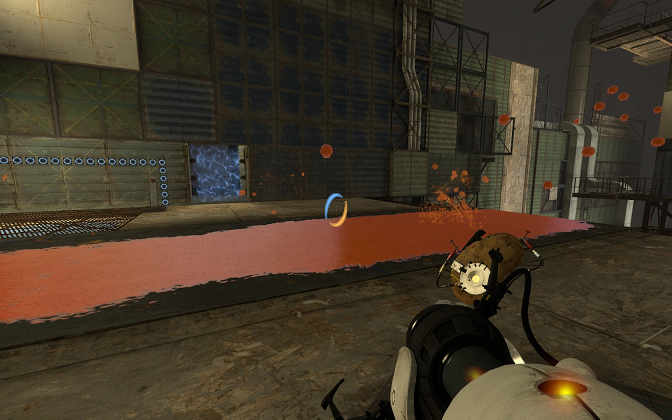 Almost everything we loved in the first Portal is still here, and works just as nicely. It’s a treat. But that is not all… Valve knew that fans would not just settle for “more of the same,” they knew they had set high standards with their work and they had to live up to them. 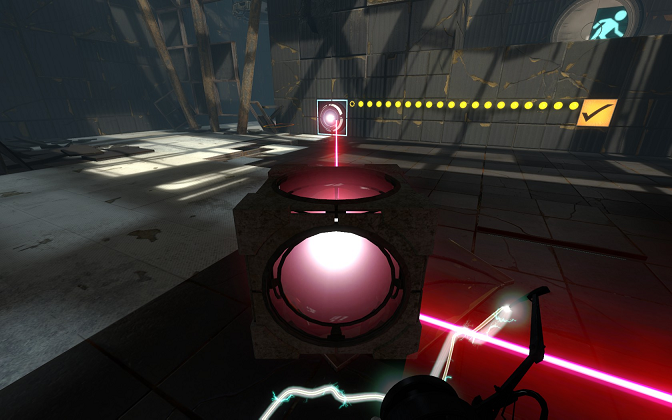 Thus, new puzzle mechanics were introduced, via usage of several new elements – bridges, funnels, lasers and the three types of gel. The light bridges are emitted from a certain device and, by using portals, you can use them to your advantage – be it to serve as a shield against turrets, or as, you guessed it, a bridge to take you to a platform you cannot normally reach (yes, they are bridges made of light, but they are HARD light bridges – you can walk on them). Successful usage depends entirely on the right placement of portals, and bridges have no other properties. Apparently made of liquid asbestos, the funnels, like the bridges, can take you to a location outside your reach. But they are a bit different – once you enter them, you are slowly dragged in the funnel’s direction until it reaches a wall. Again, with the right placement of portals, you can redirect the funnel and reach pretty far using it. You can exit a funnel at any time by moving outside of it – though it takes a few seconds to get out of it. Funnels’ movement direction can also be reversed by pressing an appropriate button in the level. 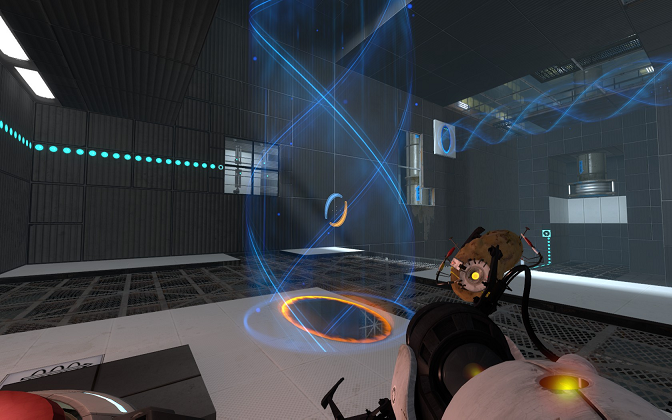 In my experience, the presence of lasers makes for fun puzzles in Portal 2. Lasers must be blocked and/or redirected to a slot needing the energy. Doing so allows you to proceed. The normal cubes allow you to block a laser, and special cubes reflecting them allow you to redirect the laser in the horizontal direction you desire. Vertical redirection is limited. Last, but not least, probably the most distinguishing features of Portal 2 – the gels. There are three gels in total – repulsion (blue), propulsion (red) and conversion (white). 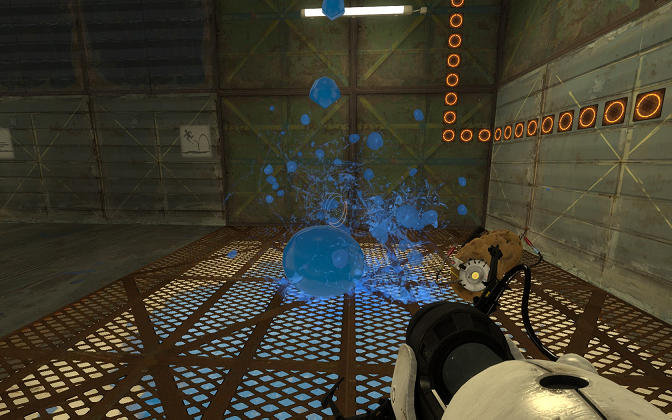 The blue gel makes anything that touches it bounce off – including turrets, cubes and, of course, you. Needless to say, you can use as a trampoline in order to jump to high places. However, it will only have you bounce depending on the height you came from. So you can’t keep bouncing and gain momentum – in order to bounce really high, you have to first come at a great speed! The red gel accelerates you as you run on it. So make a nice long path and you can accelerate greatly! It works awesomely in combination with a single spot of blue gel at the end of the path – you can jump quite far that way. The white gel is the most handy – its purpose is simply to provide you with surface you can put portals on. And that can really work miracles and help you greatly to proceed forward. Once you make a surface, a nicely placed set of portals and the gel flowing through them will help you extend it quickly and soon the hostile-at-first stage will be completely under your control! All the gels usually leak or flood from some pipe in the level – it’s your job to use portals and get the gels where they need to go so you can proceed. Occasionally, there’s also water in the level – you need it to wash an object covered in gel in order to use it better. With the basic mechanics covered, I have to say that, compared to the original, Portal 2’s puzzles feel a bit on the easy side. There are a few of them that require a decent level of thinking, especially near the end of the game, but, with most, the first solution that comes to mind is the correct one, or the steps you come up with as you go are always ones in the right direction. In a puzzle game, that is a negative. Not a big one to be sure, it’s easily outweighed by the charm, wit and just all around fun the game offers, but Portal 1 just felt considerably more difficult on my first time through. Portal 2 is much longer, however. Portal 1 felt a bit too short, this one gets the length just right. You’re done with the single player and you feel sad that it’s over once again? Not this time! In fact, you’re just halfway through. Portal offers a unique, highly entertaining co-op mode that will have you playing for at least 6-7 more hours, as long as you have a friend to do it with (and I had an awesome partner in Yrogerg123 from Netrunner). Of course, with a vast userbase like Steam’s, you can find a random player to go through it at any time, but it’s much better to work together with a friend and solve the challenges. Once you find a partner, you have to guide the two robots, ATLAS and P-Body, through a new series of chambers, all the while interacting and expressing different human emotions. Yes, in some cases that interaction is even necessary to proceed forward, so it does not feel simply like something tacked-on for more flash. You can also customise the two robots with various accessories, adding a bit more stuff to play around with that does not really affect the gameplay (think Team Fortress 2 hats). The co-op mode contributes greatly to Portal 2. It’s a whole new set of levels, completely separate from the single-player ones. And the challenge is much greater. Two heads think faster and better than one – Valve took that into account, creating much harder test chambers for this mode, and the result is magnificent. Co-op adds a whole new layer to the game – it’s certainly something we didn’t see in the first Portal, and it offers an experience hard to compare to anything else. The teamwork and mutual thinking and brainstorming towards the solution of a difficult puzzle (of which, again, there are many in this mode) is just too sweet. 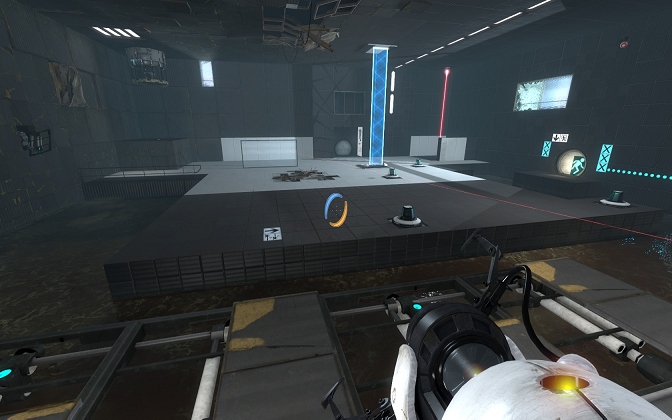 Recently, Valve have also introduced the “Portal 2 Community Test Chambers,” allowing you to build your own Portal 2 maps and play the ones created by the community. 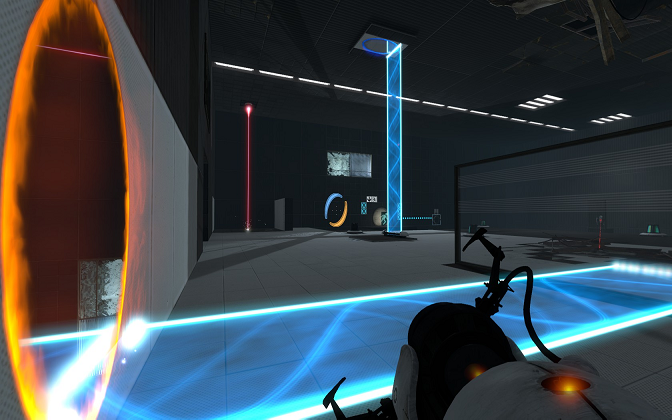 If you really enjoy solving Portal puzzles (and let’s be honest here – who doesn’t? 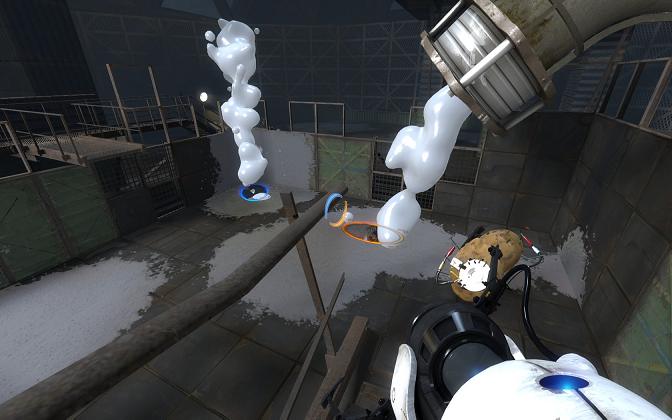 ), this initiative adds enormous replay value and is yet another reason to own Portal 2. 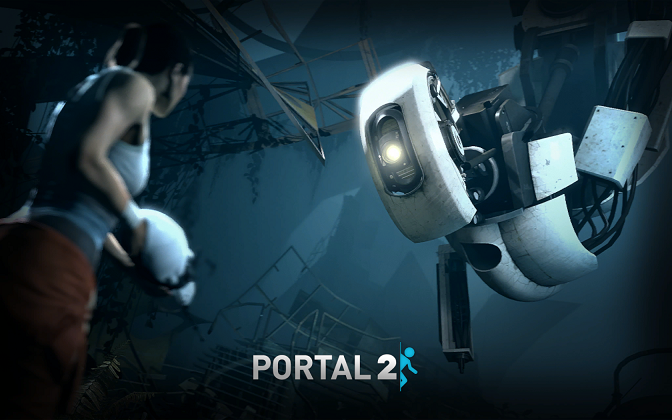 Portal 2, like its predecessor, is a very atmospheric game. The player being closed off from the rest of the world in a large lab, it’s just destined to be such. Both the graphics and the sounds contribute greatly to the overall feeling. 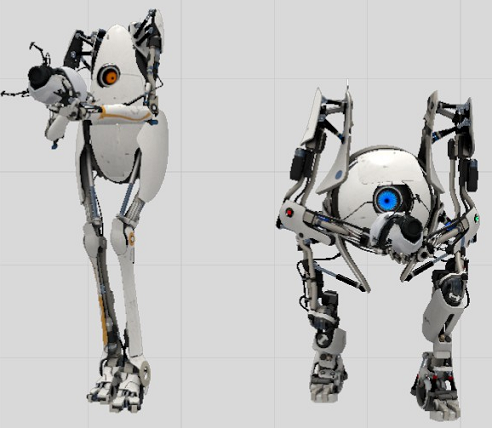 Portal 2 offers pretty much standard Source-engine graphics, with nothing particularly exceptional if you’ve already played Half-Life 2 or the original Portal. That also makes for pretty humble system requirements considering today’s market – I played through the game on maximum settings with a 4-year-old machine. But it’s pretty. It’s not all about raw horsepower, not in Portal. The environments are clean, everything is easily visible (and there’s the option to zoom in the rare occasions where you have to look really far), it’s clear which surface can hold a portal and which cannot. The separate puzzle elements are nicely drawn, many reused from the original game, of course. The gels become blobs on the floor or walls as they come in contact with them… But still splattering precisely enough so as not to allow you more freedom than the designers of the particular puzzle intended. It’s impressive. Even the loading screens change gradually, as your game is being loaded. 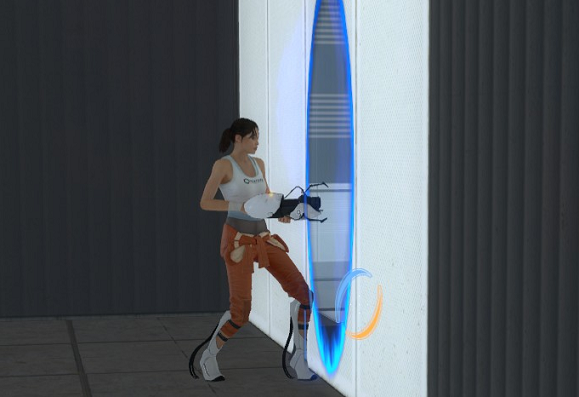 You can still see Chell by placing portals appropriately (not to mention do infinite loops and have other kinds of fun). She seems to have gotten a bit more attractive after that long beauty sleep, but the robotic legs are still kind of a turn-off. The soundtrack is not exactly Portal 2’s strongest point, with the best part being, of course, the ending song (how could it not have been after the first game). There is atmospheric music here and there, never intending to stand out and distract you from the gameplay, but the focus is on the sound effects, and I’d say they are the best part of the game’s audio (ending song aside). Every push of a button, the sound as a funnel dragging you forward, the sound of a portal opening… They are second-long sound clips, but still hard to forget. Portal 2 is a fun ride. You really can’t go wrong with it. It will make you think, it will entertain you with its humour, it will offer moments you’ll never forget. 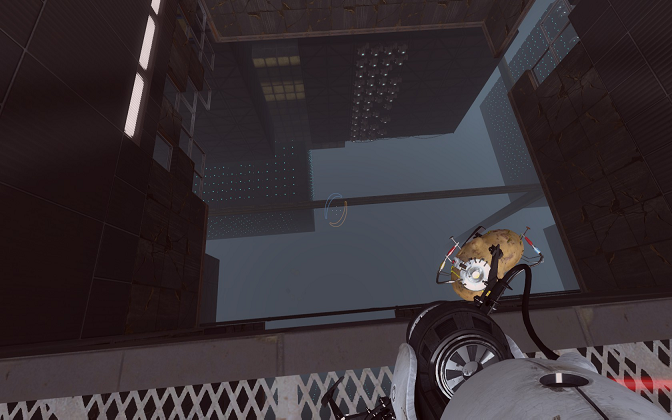 If you’ve played the first game, though, Portal 2 will hardly feel like something exceptional. Not exactly “been there, done that,” there are plenty of new elements to keep it fresh, but, let’s face it – it’s mostly about portals. Having learned how to manipulate them in the first game, you’ll not have much trouble using them to your advantage here. While considerably longer than the original, this game will feel like a breeze with the occasional really short learning time for each of the new elements. Of the three versions available, I will recommend the PC one, simply because I’m used to mouse + keyboard controls and vastly prefer them to the dual analog alternative. But keep in mind this is not an intense shooter, it’s a puzzle game, so dual analog will be sufficient most of the time even if it’s your first time using such a control scheme. So don’t be afraid if the console version is your only option. 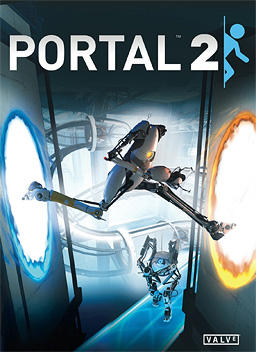 If you’re a newcomer to the concept of Portal, do start with the original game. It’s really cheap now (it’s even been free a few times) and it’ll teach you the basics that Portal 2 kind of expects you to know. I’m not saying it’s impossible to start with this one, but it’s just wrong, if you catch my drift. Besides, you really want to witness the dynamic between Chell and GLaDOS in the first game before continuing the story here. Portal 2 also offers an excellent co-op mode that really makes it stand out among other games in the market today. The increased difficulty makes it all the more pleasing, and it is one of the most fun games in the last 5 years to play with a friend. Again, the co-op mode is a completely different story path from the single-player one, so it’s almost like two games in one! Add to that the community test chambers and you’ve got a must-own game (very affordable on Steam, too!). Do you assign .5s in the scoring system, or is it just whole numbers? Rounding precision is .5 for now. I’ve been thinking about going down to .1, but it’d probably be an overkill. The only game to not have received a whole number as score so far is Wonder Boy. heeeey, Prey first introduced portals not Portal! I’m a bit embarrassed to admit… But I didn’t even know of Prey until today. Seems like a very interesting concept, portals don’t seem to be quite the same as the ones here, but it could easily have been an inspiration.